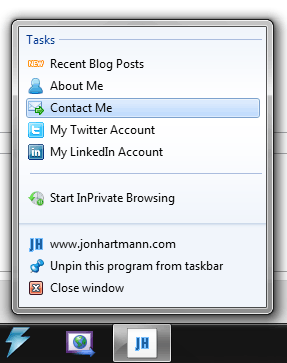 If you're not sure what I'm talking about, and you're using the Internet Explorer 9 Beta, you can pin my website (www.jonhartmann.com) as an application on your Windows 7 taskbar by clicking on the tab at the top of the screen and dragging it to your Taskbar. Once it reaches the Taskbar it should switch to a pinning icon: just drop it on the task bar and it will launch as a pinned application. I'm fairly certain that you can pin any website, but setting yours up for it gives you additional functionality. Its probably not necessary to point out that that line of code will need to go into you're site's tag, but since this is a walk through, I thought I'd point that out. Next up is a block of tags to help setup what your site will look like as a pinned application. Just like the tag, these are going to go inside your tag. Ok, there is a bit going on there, so I'll go over each one of them. The first tag, for application-name specifies your pinned app's name; in this case I just used the basic URL for my site, although I could have used "Jon Hartmann", "Jon Hartmann's Technical Blog", or even "The King's Underpants". Next up is msapplication-tooltip which is, as far as I can tell, currently broken in the IE9 beta. According to the documentation msapplication-tooltip is supposed to be displayed when the pinned application is hovered over in the taskbar, but application-name is all that displays on my system. This value specifies the URL that is launched when the pinned website is launched. In most cases msapplication-starturl is going to be your website's root URL, but it if you want to be able to pin an application thats a single page of your website or something like that its possible. 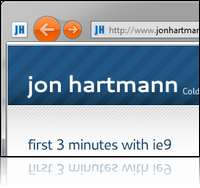 The msapplication-window setting tells IE9 how big to make the browser when it first launches for the pinned application. In my case, I've set 1024 width because my site is designed for a minimum width of 1024 pixel. Last, but not least, is msapplication-navbutton-color, which controls the color of your navigation buttons when your pinned application is launched. This tag is not purely necessary: if you omit msapplication-navbutton-color, IE9 will take its navigation button color from your favicon, just as Windows 7 uses the color of icons to color the light of its taskbar icons. For my site though, the color created from the favicon was just too light, and it didn't look good. Luckily, msapplication-navbutton-color overrides that behavior and lets you specify any hex color or valid CSS3 color name (such as "Red"). Ok, so first off, all of these tags must have name of msapplication-task, so that they are picked up as Tasks. After that the content attribute consists of three parts, the task's name, action-uri, and icon-uri. The name is just that, the name of the task displayed in the jump list. The action-uri is the URL to open for that action. These can be specified using a relative path, but I choose an absolute path for my site because not all of my links are within my domain: you can link to locations outside of your domain with your Jumplist Tasks. Lastly, the icon-uri specifies the path to an icon for use with this Jumplist Task. As far as I know, these need to be 16x16 pixel .ico files, but I've not played around with other image formats to find out. Thats all there is too it to get you up and running as a pinned application. With these changes in place, all you have to do is drag the URL of the site out of IE9 and onto the task bar to pin your website. If you haven't tried it yet, give it a try with this website: its already setup to be a pinnable application (don't forget to check out the Jumplists!). Everything works except the icon. Also, would you have to put this code at the top of every page, just in case a user used a pgae other than the home page to pin to their taskbar? Cracked it!! For some reason it wasn't liking the fact that I'd put the icons into their own separate folder, so I just put them in the root directory and bob's your uncle. I still can't work out why it didn't like my icons folder, but I don't really care that much. 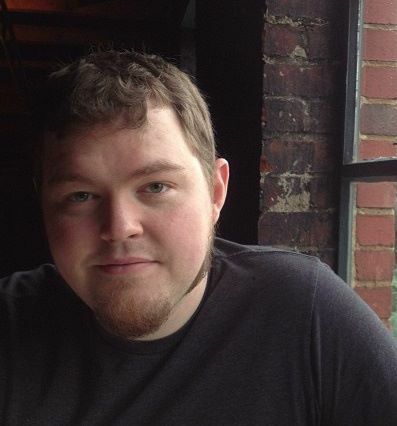 @Edd Sorry that I hadn't had a chance to get back to you yet, but I'm glad it worked for you. From what you said, is it possible that it wasn't the folder, but the URI of the icons that was causing the problem? In my example I've got my icons coming from my /icons/ folder, so it should be able to deal with sub-folders, no problem. I'm glad you got it working though, thanks for sharing!